Merhaba! I’m writing on location here in Turkey, visiting a friend in Istanbul and I have to say this city is tea central, probably one of the best places on earth to experience tea-drinking in all its glory. I can’t figure out what the preferred drink is here: coffee or tea, since they are both synonymous with this country. However, my blog is about tea so I’ll focus on that, indeed I feel that tea or ‘cay’ (chai) as they call it, is more interlinked with the daily rituals of most people and you see it everywhere on the streets here, around almost every corner you can see old men drinking at tea houses, vendors wheeling around steaming samovars around the streets, students gossiping with a cigarette and a cay outside downtown cafes and boys carrying hanging trays of it around bustling markets and streets. Tea is served served in tulip-shaped glasses unless you ask for a larger ‘fincan’, a glass mug with a handle. Many restaurants offer complimentary cay at the end of a meal and if you visit someone’s house you will be plied with it and, true to the world famous Turkish hospitality, your glass will be refilled as soon as you finish your drink. I hope you like this full-flavoured tea because if you are visiting locals houses you should probably drink it out of politeness, it’s such a way of life that if you decline a glass the response may be surprise or bemusement. Whatever you do, don’t add milk to the tea, it just doesn’t suit the flavour and people will find it very odd! If the drink is too strong, you can add more water to dilute it and add lots of sugar. I saw a an old shopkeeper add a mind-blowing six cubes of sugar to his little glass of tea, what teeth he had left looked pretty black and I expected a tidal wave of tea to flow out of the glass. You can also find the famous apple tea here, but I was surprised to find it’s not common for locals to drink it – apple tea is mostly found in tourist areas (especially at the ubiquitous carpet shops) or shisha bars. 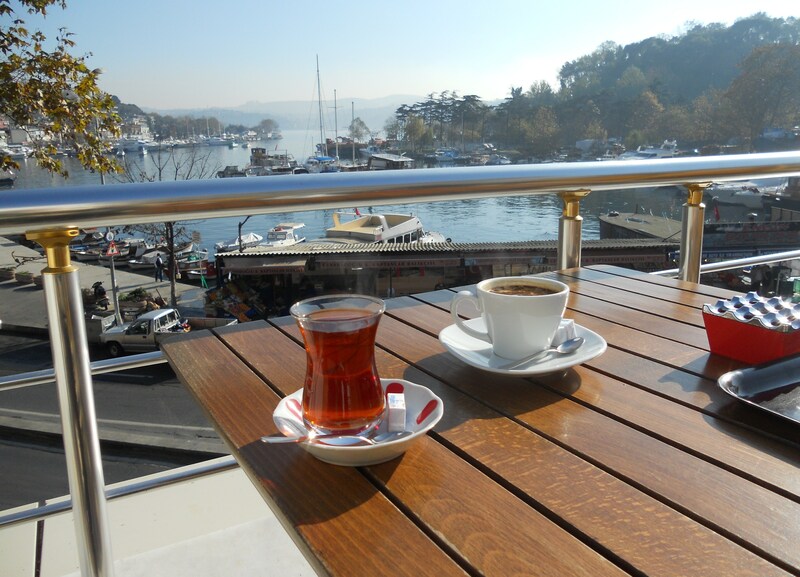 I’ve really enjoyed having a cay by the beautiful Bosphorus and recommend it to all tea lovers.